“The Spirit Bird,” poetry by J. N. Maffit, music by O. Shaw, 1842, inscribed to Eliza Fisk Harwood by “A Friend,” courtesy Elizabeth Matheson. Three thirteen-year-olds tell their coming-of-age stories in compelling detail. They left a part of themselves behind for us. If we can imagine ourselves inside the conventions of their time and suspend our own contemporary bias, we will discover the common threads of humanity that run from their time to ours, as well as the differences that time has imposed. The term, on the carpet, meant, “under consideration or discussion,” and, in Penelope Skinner’s world, it specifically referred to a belle’s status as unattached and marriageable. Penelope’s letters paint an unusually clear and vivid portrait of the lives of elite young women of the Upper South in the late 1830s. 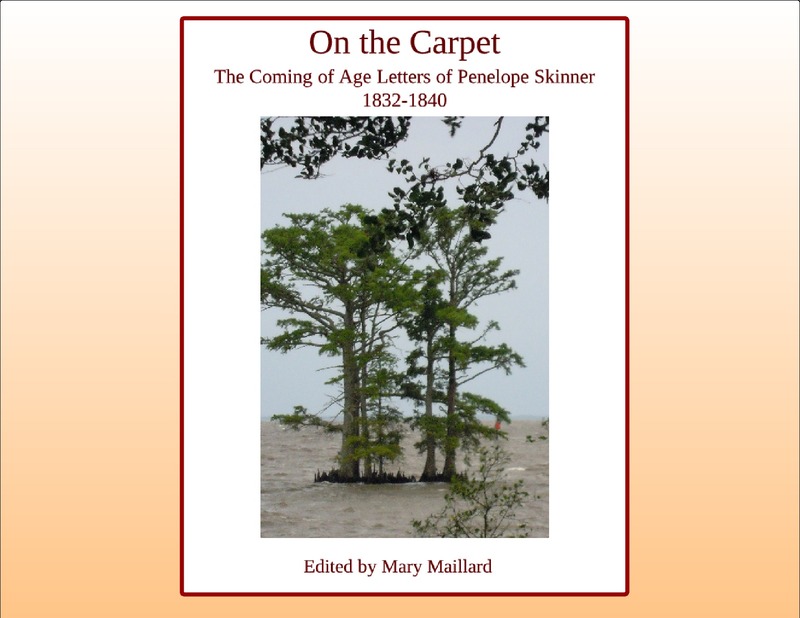 As this sparkling correspondence opens, thirteen-year-old Penelope (1818-1841) and her younger brother Trim (1820-1862) are semi-orphans exiled to distant boarding schools from the malarial climate of their plantation home in Edenton, North Carolina. They are partners in solitude, close companions, a single indivisible family unit. Outspoken and independent, Pen shares her innermost thoughts with her brother as she recounts her life as a belle “on the carpet.” From an exhilarating whirl of parties and beaux, Pen’s life descends over a period of three years into “the blues prodigious bad.” After thirty offers and three failed highly publicized engagements, her search for a husband turns desperate; she considers eloping out West with a penniless young doctor. When she finally marries at twenty-one, she undergoes an almost immediate transformation into a virtuous matron – pious, demure, obedient. Her account of her pregnancy in 1840 is unique for this period of women’s writing. 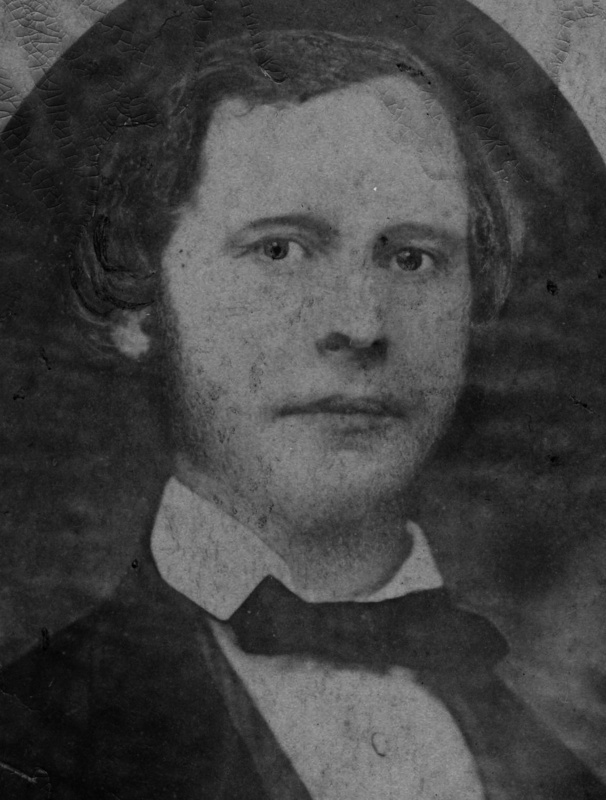 Tristrim Lowther Skinner c.1850, courtesy Rev. H. Warren Blakeman. 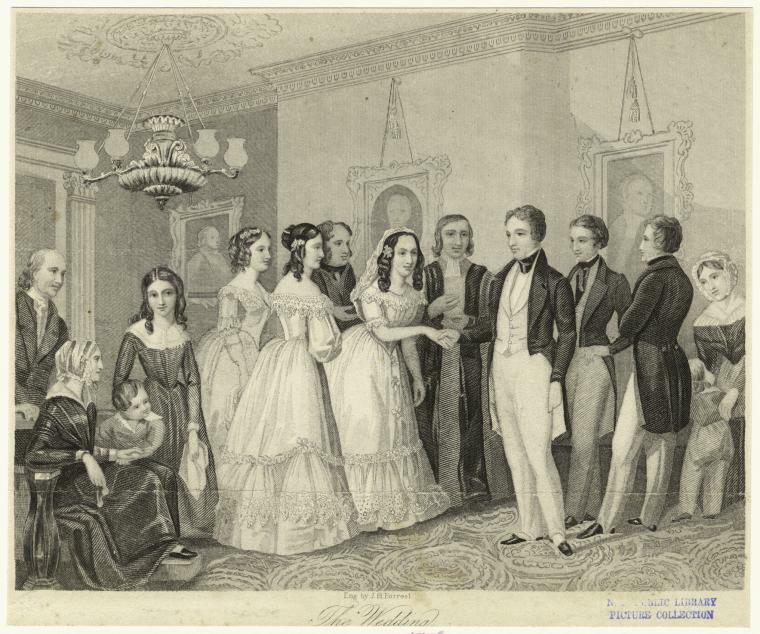 “The Wedding,” New York Public Library Digital Collection, 835589. After the Twelfth Night Party in Williamsburg, Virginia, in 1841 – thirteen years old and brimming with hopeful exuberance – Eliza Fisk Harwood wrote her close friend, “Trim” Skinner of Edenton, North Carolina, that she had danced so long she wore holes into her new satin shoes and hose. 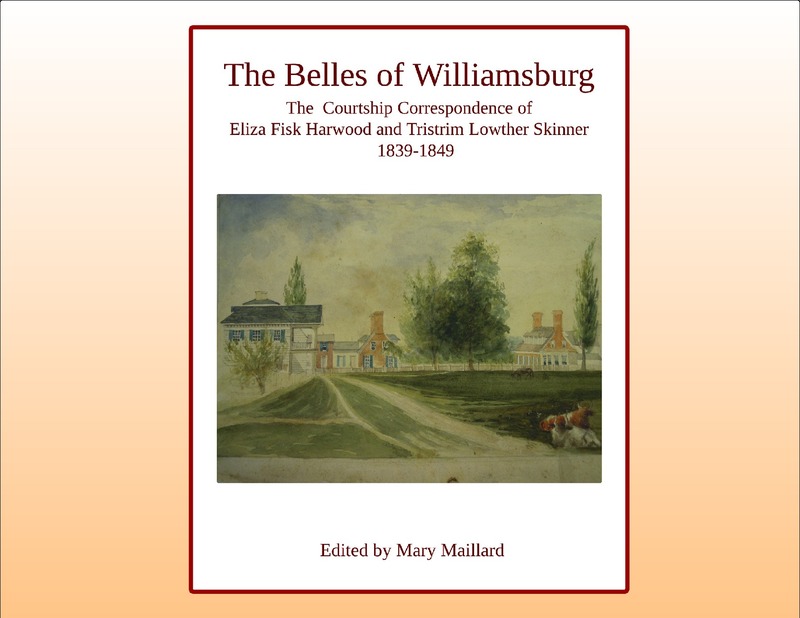 Their subsequent correspondence charts Eliza’s education, coming of age, courtships and engagement, and Tristrim’s practical education in the management of the Skinner family’s farms. 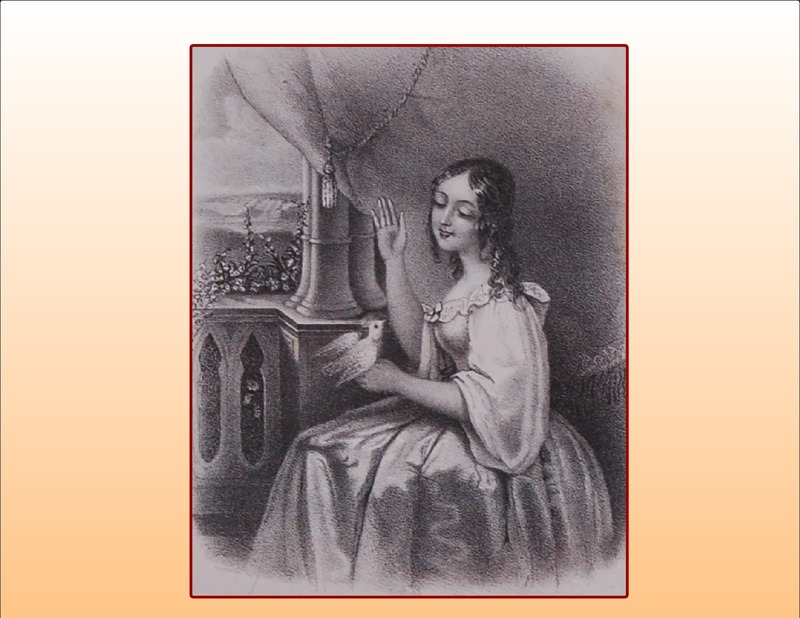 At the age of twenty-one – ten years after Trim had made her a secret promise and sealed it with a ring – Eliza married him and left her childhood home to become a Carolina plantation mistress. 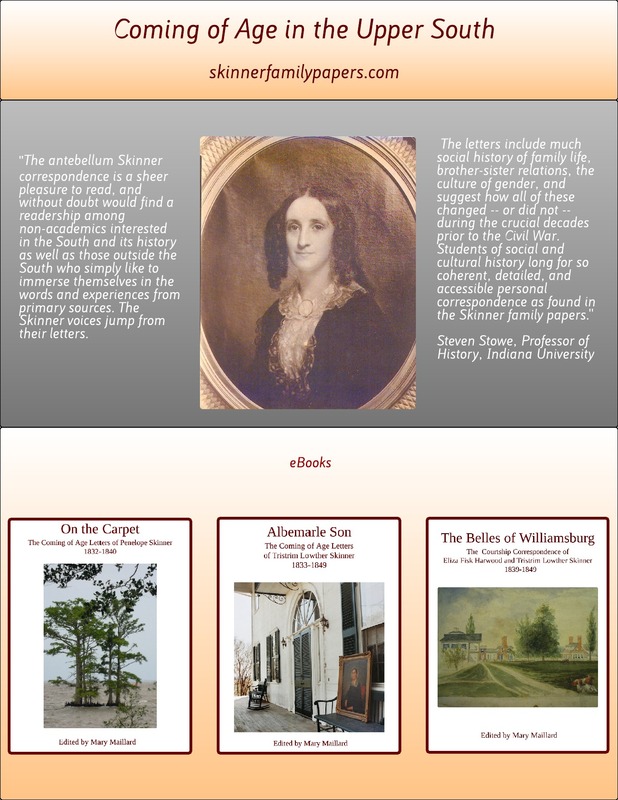 Her detailed letters are a popular masterpiece of social commentary– perhaps the only such record of Williamsburg college life during the 1840s and the earliest surviving record of a teenaged girl’s life in Victorian America. More importantly, the Harwood-Skinner correspondence sheds new light on the complex social, familial, and romantic elements of antebellum courtship in a decade not well represented among available primary sources. 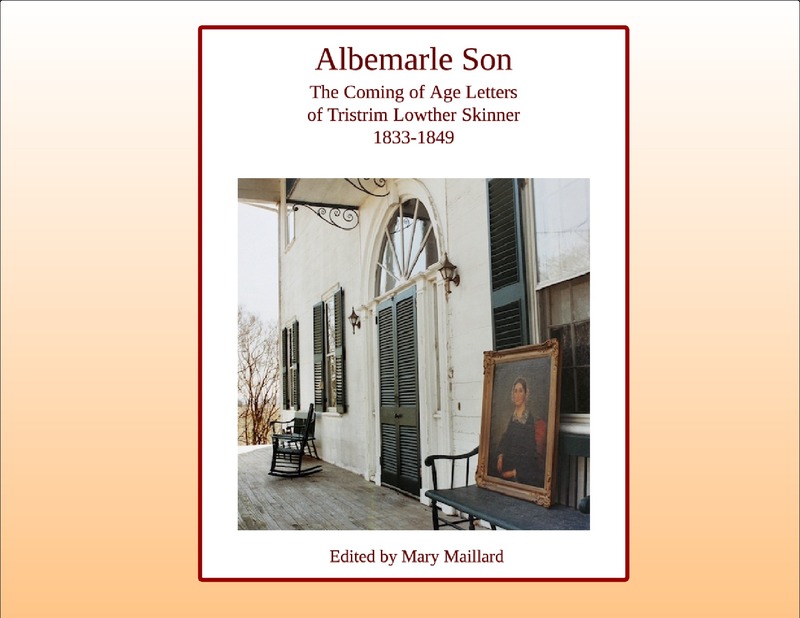 Eloquent and considered, the letters are a pleasure to read and would appeal to students, historians, and non-academics interested in the South and its history. Read a sample letter or purchase the ebook.